NEW YORK, NEW YORK – MILES MCENERY GALLERY is pleased to present an exhibition of recent paintings by Annie Lapin, on view 11 October through 10 November at 525 West 22nd Street. A public reception will be held for the artist on Thursday 11 October from 6:00 to 8:00pm. The exhibition is accompanied by a fully illustrated catalogue, featuring an essay by Julia Friedman. Annie Lapin’s newest body of work, titled “The Art of Heads and Hands,” builds upon her recent show, “Watchers and Winks, “held at Honor Fraser Gallery in Los Angeles. In this new series, however, Lapin delves further into questions about accident, history and intention in its relationship to meaning. Between spontaneity, chance and deliberation, her surreal pictures emerge with an unnerving clarity that belies the tumult of their creation. Lapin begins each piece by pouring a mixture of charcoal and water over roller marks of yellow paint –a completely unpredictable process. These marks become shadows on the linen that Lapin interprets over a series of months. Following a process of free association, she devises painterly tricks to obfuscate the accidents that occur at each stage, giving those marks apparent purpose and significance. Trompe l’oeil, Adobe Photoshop effects, images from her iPhone, and quotations from her own work and others are applied in stages, each resulting in more accidents which must be reckoned with. Her concise techniques a single layer of application despite the illusion of overlay– contradict the circuitous paths toward the end result of each painting. After several rounds of intuitive choice making, a narrative begins to emerge not only through the appearance of figures but also through the forces of space, historical note, and color. According to Lapin, “Each painting is an endpoint of a path through time, choices and interpretations. 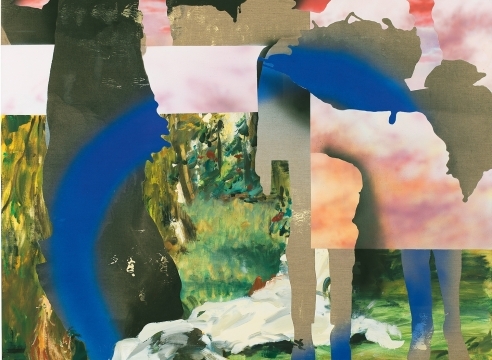 Totally random but masquerading as destiny.” In this body of work, Lapin sees her attempts to sew accidents seamlessly into the pictorial spaces as a metaphor for the patterns our minds devise to organize the morass of daily chaotic inputs. In the same way that our contemporary myths arise from chance events and subjective socio-historical interpretations of those events, these works arrive at a cohesion and become imbued with meaning despite their history of accumulated accident. 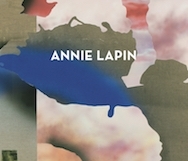 For Lapin, historical endpoints themselves have always seemed accidental. This is mirrored in her work; art historical allusions appear next to the spontaneous swirls of pours and roller marks, equal players in the story she reveals through each painting. ANNIE LAPIN (b. 1978 in Washington, D.C.) received her Bachelors of Arts degree from Yale University in 2001, a Post- Baccalaureate Certificate from the School of the Art Institute of Chicago in 2004, and her Master of Fine Arts from the University of California, Los Angeles in 2007. Recent solo exhibitions include “Watchers and Winks,” Honor Fraser, Los Angeles, CA; “How To Bury Your Stuff,” Josh Lilley, London, England; ”Various Peep Shows,” Honor Fraser, Los Angeles, CA; “See?,” Annarumma Gallery, Naples, Italy; “Annie Lapin: Falk Visiting Artist,” Weatherspoon Art Museum, Greensboro, NC; “Amnesiacs,” Josh Lilley Gallery, London, England; “Find Finding ing,” Yautepec Gallery, Mexico City, Mexico; and “History=ing,” Museum of Contemporary Art, Santa Barbara, CA. Recent group exhibitions include “The Ecstasy of Mary Shelley,” Los Angeles Contemporary Exhibitions, Los Angeles, CA; “Her Crowd: New Art by Women from Our Neighbors’ Private Collections,” Bruce Museum, Greenwich, CT; “Tribal Tats,” Arturo Bandini, Los Angeles, C A; “Angels With Dirty Faces, ” Hilger Contemporary, Vienna, Austria; “Lost in a Sea of Red, ” The Pit , Los Angeles, C A; “Sincerely Yours, ” Torrance Art Museum, Torrance, C A; “ The Go-Between, ” Museo di Capodimonte, Naples, Italy; “Dee Ferris, Barnaby Furnas, Annie Lapin, ” Sargent’s Daughters, New York, N Y; “B. A . T. (Bon à Tirer/Good to Go), ” Offramp Gallery, Pasadena, CA; “Annie Lapin, John Lehr, Alon Levin, Philip Vanderhyden,” Andrew Rafacz Gallery, Chicago, IL; “Fanatic,” Post, Los Angeles, CA; “Raw Material,” Yautepec Gallery, Mexico City, Mexico; “Stone Gravy,” Ameringer | McEnery | Yohe, New York, NY, curated by David Pagel; and “Chasm of the Supernova,” Center for the Arts Eagle Rock, Los Angeles, CA, curated by Adam Miller.